Making your own gnocchi is great fun and a real kids' favourite served with pesto, or simple tomato sauce and some grated cheese. 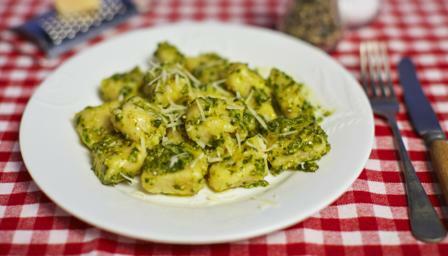 Make sure the sauce is ready before you cook the gnocchi as it needs to be served straight away. Kids job: For the pesto, wash the basil leaves under the tap and dry them on a tea towel or in a salad spinner. Kid’s job: Add the basil leaves to a food processor with the crushed garlic, toasted pine nuts, grated parmesan and olive oil. Add a twist of black pepper and then blend to a paste. You may need a little more olive oil to make it smooth. (Adults should supervise this.) Spoon into a jar and store in the fridge until needed. Adult’s job: Preheat the oven to 200C/400F/Gas 6. Prick the baking potatoes all over with a fork and place in the oven to bake for 1-1½ hours. (Oven timers are great if you’re at work – put the potatoes in the cold oven in the morning and set it to come on 90 minutes before you get home.) If you are using leftover baked potatoes, they will need to be warmed up again or the gnocchi will taste doughy - put them into a warm oven for 10 minutes or microwave on high for 30 seconds. Kid’s job: If you are using freshly baked potatoes allow them to cool enough to be handled safely and then slice them in half and kids can scoop out the flesh into a large bowl. Add any cooked squash or carrot if you are making the orange option. Kid’s job: Mash the cooked potato with a masher or a large fork, until it is smooth. Kid’s job: Add the egg, flour, grated cheese, black pepper and nutmeg (and the spinach or herbs if you are making the green version) to the bowl and mix together with your hands until you have a smooth dough. If the dough is sticky you can add more flour – it should feel like play dough. Kid’s job: Divide the dough into four balls. On a lightly floured surface or table roll the potato dough into a long sausage and then, using a table knife cut it into 15 x 2cm/1in pieces. Kid’s job: Press each gnocchi with a fork to make a ridged pattern (this helps them cook and also helps sauce stick to them). Repeat with the rest of the dough. Adult’s job: Bring a large pan of water to the boil with a pinch of salt. Place 10 gnocchi at a time carefully into the water and boil for about 30 seconds - the gnocchi will rise to the surface of the water when they are cooked. Adult’s job: Remove the gnocchi from the water with a slotted spoon into a warmed bowl and stir in a teaspoonful of the pesto. Add another batch of gnocchi to the pan of water and repeat until all of the gnocchi are cooked. Serve immediately with a green salad.